These spicy cookies came together in the same off-beat way that pieces of daily thought and feeling experience make up the components of a dream. The first wacky component came from something I do regularly in the cold months when its an asset to have the oven on. I make Romeo homemade dog biscuits. A couple of years ago I got a seventy nine cent cookie cutter in the shape of a dog bone at our “everything store” and began. I altered a recipe for some Easy Peanut Butter Oatmeal Dog Biscuits I found on the internet to be gluten-free (because I have no glutinous flours in the house), I left off the optional egg wash, and halved the recipe. 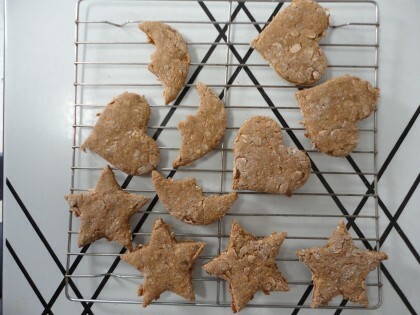 These dog biscuits are easy to make, and the extra fun part is that I get to roll out “dough” again. Ever since I was a little girl and made Paintbrush Cookies from the Betty Crocker Cookbook for Boys and Girls I’ve always loved making cut out cookies for the holidays. My belief, like that of so many, was that they needed staggering amounts of butter and sugar to work. But over the many months I repeated and refined my dog biscuit making, I must have began to question this common wisdom. 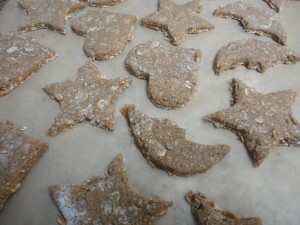 One night this fall I found myself giggling out loud as I wondered how I might make the dog biscuits into something like a gingerbread cookie people would want to eat. These musings became the baseline for what would become a recipe. But the energy that pushed the barrel over the waterfall, so to speak, came from an even more wacky and unlikely–or maybe very likely place–the ending of the experimental novel Calendar of Regrets by my friend and former colleague Lance Olsen. In one of the final scenes, the famous painter Heironymus Bosch is in the middle of a near death experience resulting from a poisoning by one of his religious adversaries. His near death experience is one of falling through space alongside others who may happen to pass by, Alice-in-Wonderland style. As he’s falling, a burned girl he once saw carried past his house on a stretcher when he was a boy in the midst of of a great fire falls next to him for a while, and, having never met in life, they finally converse. Giving her a voice, and a “life” in the afterlife is a stroke of genius. She gets a name, too–Arabella, and becomes the most memorable character in the book for me. With that description, I was hooked on a made-up memory of a cookie in a book. I had never made a cookie with white pepper in it. And I wanted a street fair below my eyes. And a texture that was “crackly and chewy and all melty at once.” I thought about it for days. And then, one night, all of a sudden, the rolling pin was out and these cookies were born. Literature never tasted so vegan and gluten-free good. There’s one more remnant of the day that made it into this recipe by literally being out on the counter: the apricot fruit spread. Suddenly it seemed like the way to the street fair, too. Preheat oven to 350. Heat some water in your tea kettle. Mix dry ingredients in a mixing bowl with a fork. 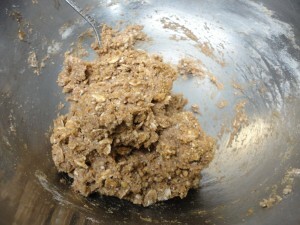 Add tahini, jam and molasses and continue mixing with fork until well combined. Add 1/2 of water from what’s come to the boil in your tea kettle. Mix until it hold together as dough. Flour a wooden cutting board or other surface with brown rice flour (or some other gluten free flour you have, but brown rice flour works really well). 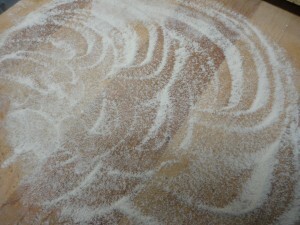 Turn the dough out onto the floured surface. Flip and turn until the ball of dough is covered with the rice flour. Roll out with a rolling pin to about 1/3-1/4 inch thickness. Cut out stars, moons and hearts (or your favorite shapes). Place on cookie sheet lined with parchment paper. Bake at 350 for 18-20 minutes. Cool on a rack. Notes: If you don’t have date syrup, you can try using all molasses, which I think would be good. If you don’t have molasses, you could try using all date syrup or homemade date paste, but I think the cookie just a tad too mild without at least a little molasses. So if you can splurge on that little bit of official sugar, splurge. A little molasses now and then seems to do me good. These are meant to be mildly sweet cookies, so if you like very sweet, taste dough and add accordingly. But then you might have to add a little more flour to even things out. It’s a chemistry experiment. If you want to make these without oats, you can try increasing the ground buckwheat and chickpea flour by 1/4 cup each to make up for the oats. 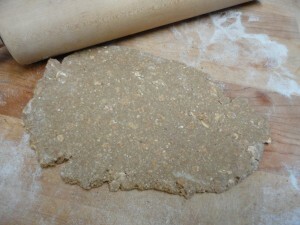 Or use 1/4 cup of sorghum flour and 1/4 cup of tapioca starch instead of the oats. Or maybe get adventurous and grind up some amaranth in place of the oats. Perhaps these could be a bit spicier. Perhaps not. Use your dough tasting skills and adjust according to your personal preference. If you want to make some of these into dog biscuits, just leave a few of them on the baking sheet in the turned off even overnight. They will be hard as rocks the next morning, just the way dogs like ’em. 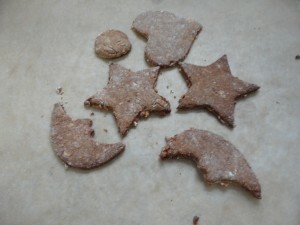 Having spent the night in the turned off oven, these cookies magically turned into dog biscuits for Romeo. Store these cookies (and dog biscuits) in the fridge. Or if you have amazing self control, save some of them in the freezer, which always does a gluten-free cookie good. I was going to start this post with “on a night not fit for man or beast,” here’s a cookie fit for both. So I guess I’ll end it that way, with the disclaimer that I also plied 2 of my human neighbors and another human friend with these cookies and they all proclaimed them delicious. They make cozy company with a cup of tea, too. And as Winter Solstice approaches, it’s nice to celebrate it with a street fair of stars, moons and hearts below the eyes. Thanks for the inspiration, Romeo and Lance!! This is absolutely perfect timing. I’ve been jonesing for gingersnap cookies after someone brought some into work the other day that I can’t eat (they aren’t gf let alone vegan). Now I have something to try tonight! Hi Angela–thanks!! Ah, Practical Magic! !–I read that book and then saw the film years ago and enjoyed it all very much. 🙂 Yes, it sounds too hot for the oven in your corner of the world. But you’re right, the recipe will keep for cooler weather. A very Merry Christmas back to you! Yum! I love making dog biscuits, but since I don’t have a dog of my own at the present moment, I don’t get to very often. 🙂 They are fun and easy to make – it’s great they inspired you to make a version for the 2-legged kind. I will put these on the list to try, and it’ll be nice to get out my cookie cutters again! I hope you stay warm – I don’t know how you do it! You’re hardier folk than I, especially since you go out in it to walk Romeo… I hope the weather levels out and your stove provides warmth and no more issues! The recipe looks yummy–I will definitely be making some this weekend. This looks wonderful Maria, I really can’t wait to try! I usually make the Happy Herbivore sugar cookies around Christmas but would love to try a lower fat version. So thank you! Made these today. We added a bit more sweetener for our tastes. Thanks! You’re welcome, Corrin–so glad it worked out. Thanks for letting me know. Good strategy to customize sweetener to personal tastes. Oh, these sound perfect for Hogmanay too! I hope you have a happy and hopeful time as I wish for all. I have to admit that when I had a dog I made dog biscuits for us both (it created havoc as he always was determined they were all his!). I did manage to snaffle a few! My dilemma is that I don’t like buckwheat. Do you think I could use Teff? It has a natural sweetness to it that might enhance it. What do you think?